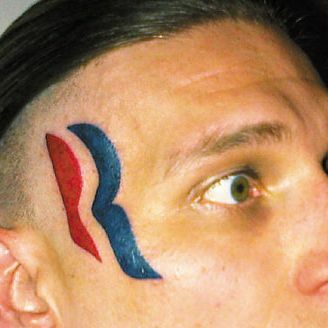 Since the election Mitt Romney has seen Republicans turn their backs on him and watched Facebook friends abandon him by the thousands, but nothing hurts quite as much as this (for everyone involved): 30-year-old Eric Hartsburg of Indiana is removing the Romney/Ryan logo tattooed on his face. Hartsburg had vowed to keep the tattoo, even after Romney lost and he received an offer to have it removed for free, but Romney’s “gifts” remark changed his mind. “It stands not only for a losing campaign but for a sore loser,” Hartsburg said. “He’s pretty shameful as far as I’m concerned, man. There’s no dignity in blaming somebody else for buying votes and paying off people. I can’t get behind that or stay behind that.” Maybe Romney thinks there’s no dignity in going back on your promise to bear the mark of Mitt forever.